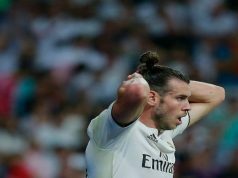 Real Madrid put pressure on leaders Atletico Madrid with an emphatic victory over bottom side Osasuna at the Santiago Bernabeu. Cristiano Ronaldo made a brilliant return to the Spanish competition with a brilliant performance, including two superb goals. It was easy for Los Blancos since the first minutes, as Ronaldo opened the scoring in the sixth with an incredible strike from 25 metres. The Portuguese fired a powerful shot to the top corner, making it impossible for Andres Fernandez to reach the ball. The visitor’s goalkeeper made some quality saves that kept his team alive in the first half. Osasuna were very passive, and Ronaldo threatened Fernandez constantly. 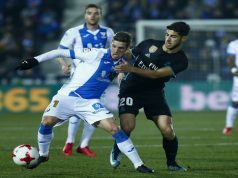 Real were in total control of possession and had several chances with shots from Ramos, Ronaldo and Modric, but the keeper denied all of them. However, the second half started just like the first. In the seventh minute, Ronaldo grabbed a ball on the left side of the attack, dribbled past one defender and dribbled an unstoppable strike to the top right corner. Ramos, who also had a magnificent performance, made it 3-0 in the 60th minute. Angel di Maria clipped a ball into the box and the Spaniard rose above everyone to bullet a header home underneath Fernandez. With the game under control, Carlo Ancelotti sent Ronaldo, Modric and Di Maria to the bench, giving them some rest for the crucial match in Munich. Yet, Real were able to score more goals. Madrid had their fourth as Isco sent a cross into the box and Daniel Carvajal headed the ball over Fernandez to the back of the net. Alvaro Morata also scored, but his goal was disallowed as the referee blew for a free kick. 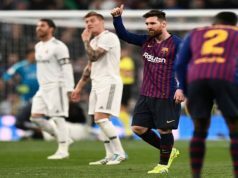 It was a brilliant game from Los Blancos, who earned an easy victory letting their best players rest for the second leg of the Champions League semi-finals.